For companies, and for individuals who work with data storage and management, few things can be more important than data security. Many companies store their core data in databases, where it is vulnerable to threats including hardware failures, malicious attacks, erroneous user operations, database corruption, and data loss caused by natural disasters. In the new data technology (DT) age, it is vital that measures are taken against these threats to data security. For relational databases such as SQL servers, database backup provides a strong guarantee of disaster recovery (DR) capability. The data backup types outlined in this article can be effective tools for keeping data secure. Full backup is the simplest and most fundamental database backup of all the SQL Server backups. Full backup stores a full copy of a specific database at the point in time that the backup completed. 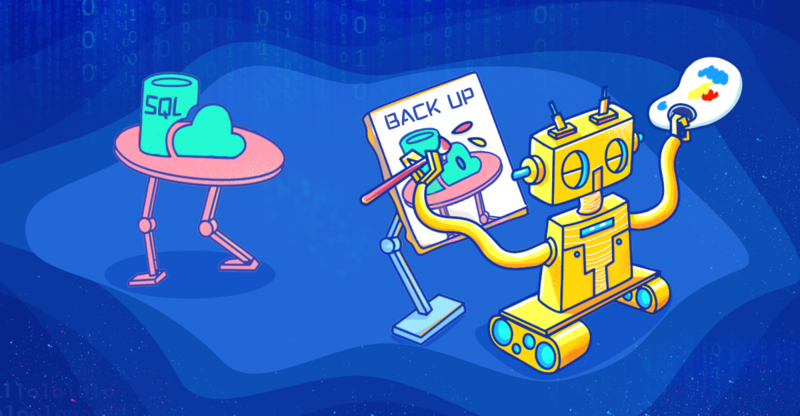 The drawback of full backup is that it can only restore the database to the point in time when the backup completed successfully. This means that the system can only be restored to the point in time when full backup was completed, and not to any point in time within the database history. 7 p.m.: Data #1 is generated. 10 p.m.: The database is fully backed up and the backup file contains data #1. 2 a.m.: Data #2 is generated and the database contains data #1 and #2. 6 a.m.: Data #3 is generated and the database contains data #1, #2, and #3. 10 a.m.: The database is fully backed up and the backup file contains data #1, #2, and #3. 1 p.m.: Data #4 is generated and the database contains data #1, #2, #3, and #4. 5 p.m.: Data #5 is generated and the database contains data #1, #2, #3, #4, and #5. 8 p.m.: Data #6 is generated and the database contains data #1, #2, #3, #4, #5, and #6. 10 p.m.: The database is fully backed up and the backup file contains data #1, #2, #3, #4, #5, and #6. Database backup requires a large volume of I/O resources. As a result of this increased demand on I/O resources, database backup operations may slow down database queries. =This may result in the transaction log growing until it takes up all the free space in the disk. 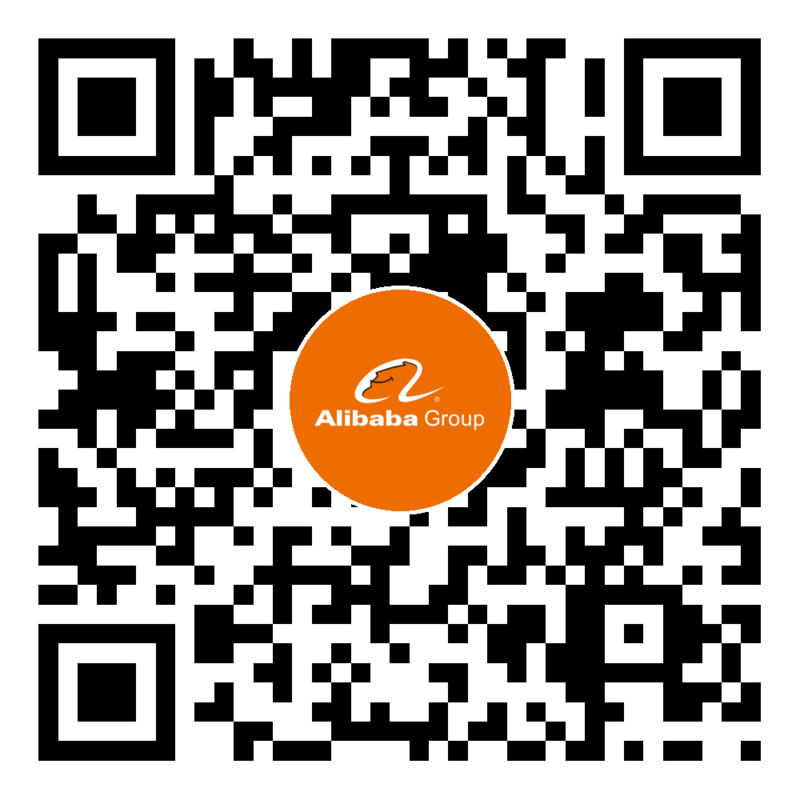 For Alibaba Cloud RDS for SQL Server product users, this is a common scenario. Transaction log backup, which is also detailed in this article, is one potential solution. 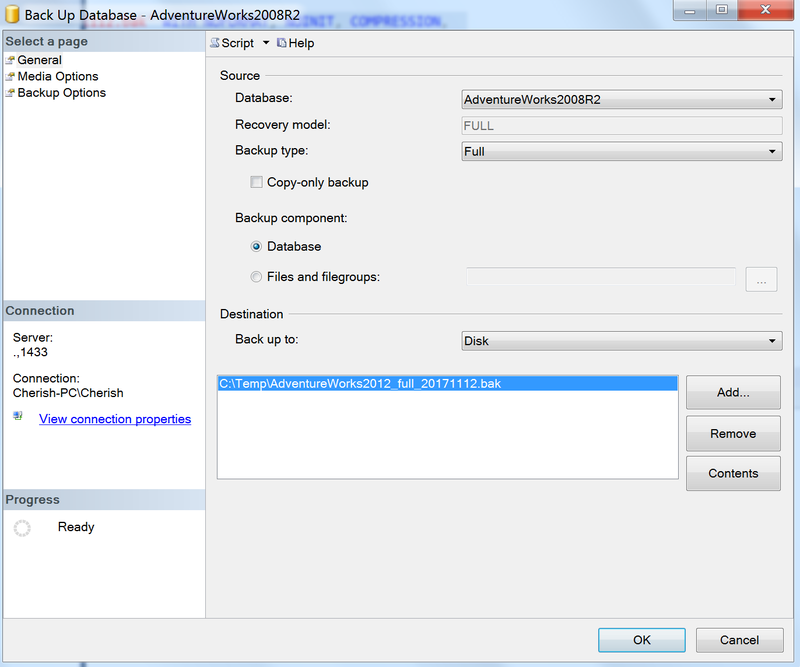 SSMS integrated development environment (IDE) interface operations can also be used to create a full database backup. Right click on the database to be backed up. Select Tasks > Back Up. Select Full for Backup Type. Select Disk as backup file storage. Click on Add to add backup file. Select a directory to store the backup file. Enter the backup file name. During the full backup process, the transaction log can grow significantly. Transaction log backup provides a solution to this issue: transaction log backup creates a record of all transaction log changes submitted from the last log backup, or the full backup which the transaction log started from, to the current point-in-time. 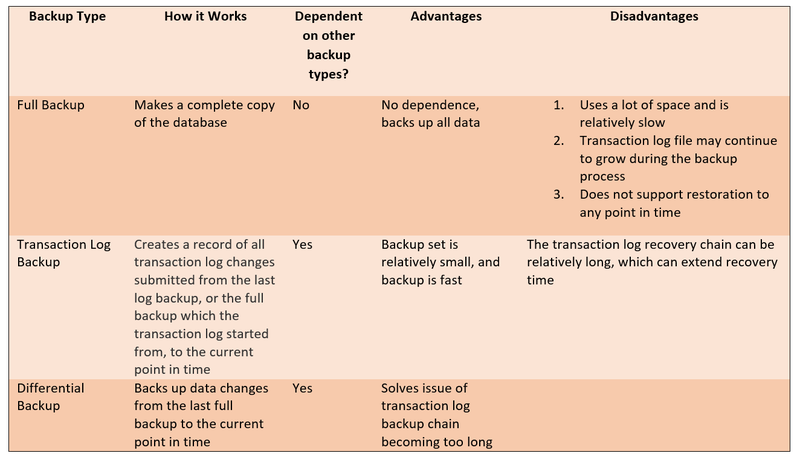 Transaction log backup can work with both full backup and differential backup to restore the database to a specific point in time. 00:01: Transaction #1, which contains LSN #1, #2, and #3, starts and is submitted. 00:02: Transaction #2, which contains LSN #4, #5, and #6, starts but is yet to be submitted. 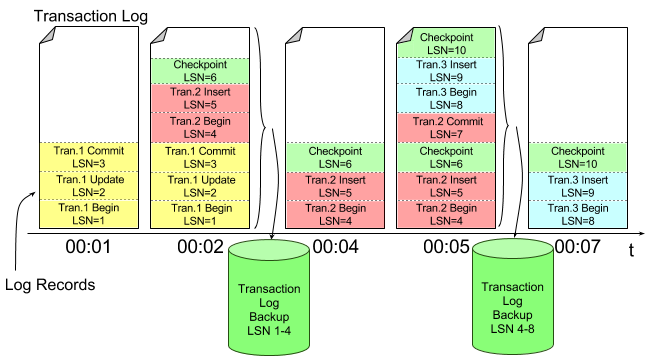 The transaction log backup file contains only LSN #1, #2, and #3. 00:04: Transaction #2, which contains LSN #4, #5, and #6, is still running and has yet to be submitted. 00:05: Transaction #2 starts LSN #7. Transaction #2, which now contains LSN #4, #5, # 6, and #7, is submitted successfully. Transaction #3, which contains LSN #8, #9, and #10, starts but is yet to be submitted. The transaction log backup file contains LSN #4, #5, #6, and #7. 00:07: Transaction #3, which contains LSN #8, #9, and #10, is still running and has yet to be submitted. Once transaction log backup has completed, the transaction log file can be truncated, and the transaction log space can be reused. This solves the issue of the transaction log growing constantly during a full backup. Regular database transaction log backups help control transaction log file size. Regularly performing database transaction log backups is recommended. The database must be in the full recovery model before transaction log backup can be performed. Right click on the database where the transaction log backup will be created. 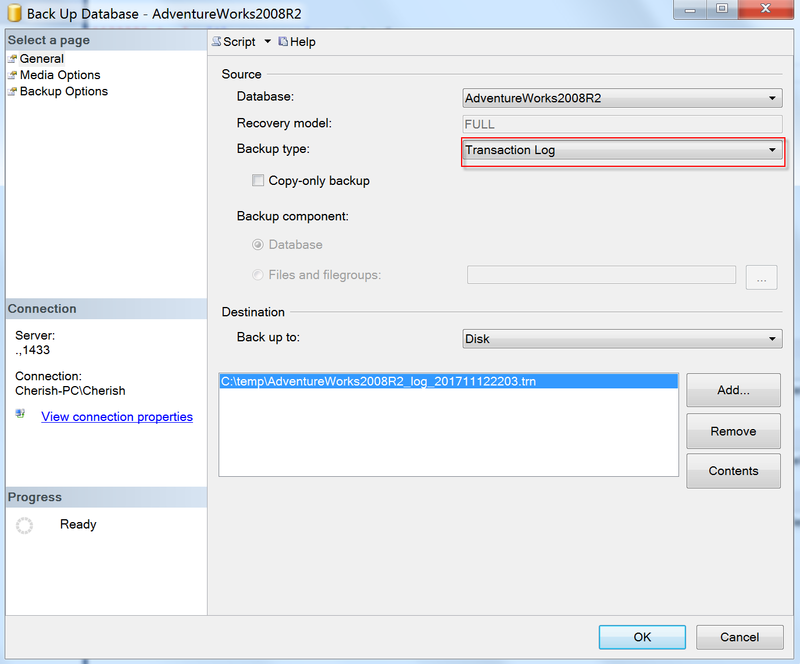 Select Transaction Log for Backup type. Transaction log backups are connected through transaction log chains. The transaction log chain always starts from a full database backup. Each transaction log backup file has its own FirstLSN and LastLSN. The FirstLSN equals the LastLSN of the previous transaction log backup file. The LastLSN equals the FirstLSN of the next transaction log backup file. This is how connections are established between transaction log backup files. The LastLSN of AdventureWorks2008R2_log_201711122201 equals the FirstLSN of AdventureWorks2008R2_log_201711122202. In this way links are established along the transaction log backup chain. 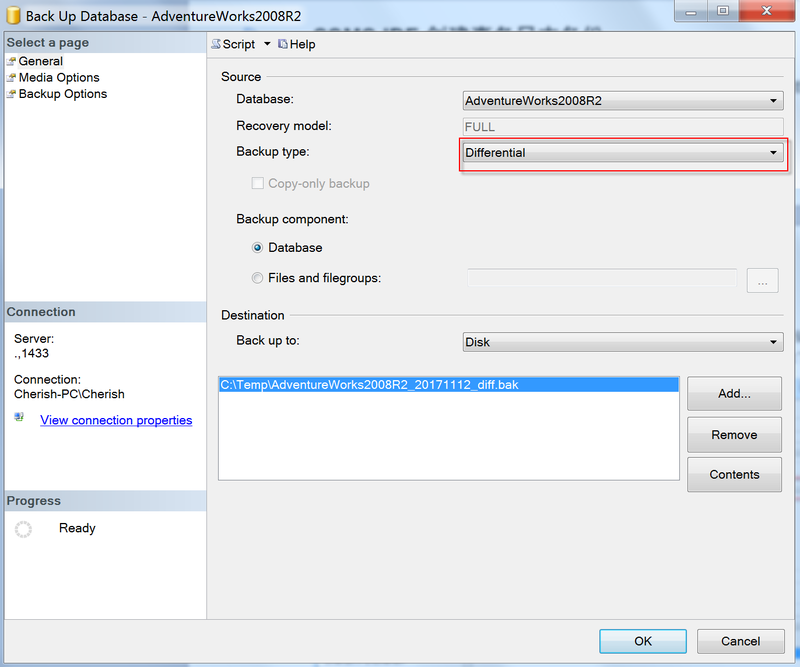 If any loss or damage happens to AdventureWorks2008R2_log_201711122202, the database can only restore the transactional behavior that is contained in AdventureWorks2008R2_log_201711122201. Another issue is that transaction log backup must be performed at least every five minutes. This protects against the risk of losing data, prevents the database transaction log from constantly growing, and removes the need to constantly perform full backups. If transaction log backup is performed every five minutes, this means 12 backups per hour, or 288 backups per day. This can cause the transaction log recovery chain to become too long, which in turn can extend recovery time and make it harder to achieve the recovery time objective (RTO). Differential backup technology can help address this issue. Differential backup backs up all data changes from the last full backup to the current point in time. It usually takes up much less data space than a full backup. It ensures greater backup efficiency, higher restoration speed, and better disaster recovery capability. 7 a.m.: Database contains data #1. 10 a.m.: Database is fully backed up and the full backup file contains data #1. 1 p.m.: Database contains data #1, #2, #3, and #4. 2 p.m.: Database is differentially backed up, and the differential backup file contains data #2, #3, and #4. This represents all changed data between the last full backup and the differential backup at 2 p.m.
4 p.m.: Database contains data #1, #2, #3, #4, #5, #6. 6 p.m.: Database is differentially backed up, and the differential backup file contains data #2, #3, #4, #5, and #6. 8 p.m.: Database contains data #1, #2, #3, #4, #5, #6, #7, and #8. 10 p.m.: Database is fully backed up and the full backup file contains data #1, #2, #3, #4, #5, #6, #7, and #8. 11 p.m.: New data #9 and #10 are generated and the database contains data #1, #2, #3, #4, #5, #6, #7, #8, #9, and #10. 2 a.m.: Database is differentially backed up, and the differential backup file contains data #9 and #10. Select Differential for Backup type.